This is so beautiful not only it’s my all time favorite color but it’s reversible either light purple or dark purple plus very comfy and keeps you very warm. This comforter set has a special double-needle stitching and baffle box design so the filling won't bunch up or move around. Plus, you can just throw it in the washing machine to clean it. The shams give your bed a complete, matching look. This reversible set will give your bedroom modern style. This comforter set is super soft and fluffy. True to color. Well made.Nice Stitching. I like that I can use the double side color to use with my two different sheet set. The color is vivid. 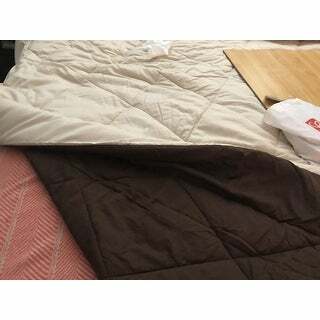 The comfort all-season down alternative 3-piece reversible comforter set is convenient, and satisfying; it is warm, and I like the chance to change the color of its appearance just by turning it. I thought the fill would be thicker and puffier. Its skimped out on the weight of the fill.and it is too small it claims its a king/cali king but more like a queen. I will just use it in one of my spare bedrooms..too much hassle to send back. Love this comforter set light weight and perfect for my bed. Deceptive advertising is not ethical. the brand name is "ELEGANT COMFORT" AND WHAT I GOT IS NOTHING LIKE THAT. Flimsy material, very thin fill and not even nice enough to give to a kid. Sooooo disappointed. Now it will cost me money to return it. Not fair. Very nice comforter set So soft. 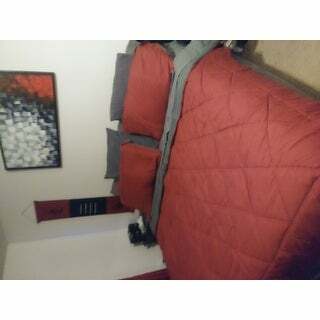 The comforter is heavy but fits in a standard washing machine, the red is a deep red not bright which blends real well. The shams have buttons on them, one of the buttons broke in half when I was buttoning the sham or I would give this a five star. Very vibrant colors, the perfect plum shade I needed for my bedroom. Very soft fabric and since I live in a warmer climate it's a nice summer weight. Great quality and so soft. 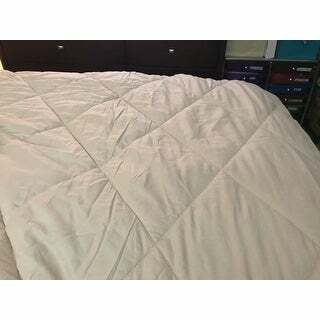 I spent quite a bit on this comforter and it was not worth the * its very thin and made fairly cheap. So disappointed I probably won't buy from here again. I’ve got several down comforters and have to say this one is awesome. It’s lightweight and so soft. The colors are perfect for my bedroom. My simple son loves gray and black combinations. When this comforter arrived, he was thrill to find out it belonged to him. I bought it for a gift, but the person I got it for loved it. the color is pretty. a little thinner and shorter than i am used to, but overall ok. i have even had to wash it in my personal washer and it retained its natural look without losing integrity. "Are the shams also reversible in color?" "Is this a calif. King set"
Hello Veronica, this will fit both a king and california king. Thanks for shopping with us! "I am looking for a orange as in Harley Davidson orange comforter is this orange comparable? " Hello, yes, the orange option is the same kind of orange as the Harley Davidson insignia. Thank you for shopping with us! "I am redoing my room and was looking at the Pink and Grey comforter. Is it more of a pastel pink or a dark pink? Also the reviews are terrible...what is this product like? I'm expecting comfortable and pufffy..??" Hello akov24, In my opinion the pink on the comforter appears to be bubble gum pink in color. We try to represent the colors of our products accurately. Unfortunately, due to the difference in monitor colors we cannot guarantee that the color will match exactly what you see on your screen. Also, I would recommend you look at the first hand reviews on this product as they are very mixed. Thank you for shopping with us. Because my bedroom is black and grey and I love Microfiber material. because it was grey and it didn't cost 1000 dollars.